One of the things that were introduced in the Bespin Gambit expansion for Imperial Assault was the Hidden condition. It’s rather cool, but can lead to weird situations like this one that you’re standing right in front of the enemy, but they’re ‘hidden’. We looked it up and even big figures can be hidden… in plain sight. This whole hidden thing just screamed for a comic. We’re still hoping there will one day be an app for Imperial Assault that takes over the role for the Imperial Player. Such an app was released for Descent and we think we would try playing another Imperial Assault campaign with an app. Nobody seems really motivated to take on the role of the Imperial Player at this time. But until that day we’re now playing all sorts of other games! Last week we’ve played the dexterity game Ice Cool, which was suprisingly hard but a lot of fun. We’ve played Concordia, which I lost horribly, but it’s a great and clever game. And Heinze and me finally got our hands on a copy of Android Netrunner: Terminal Directive! W000t! We’ve only played one game yet, but we’re both eager to continue the story and to be playing some Netrunner again. They confirmed they are working on the IA app already they are saying 3-4th quarter so hopefully around gen con. That would be a great time to have it, the heart of the empire expansion will probably be released around that time so it seems logical to boost sales by releasing the app :). I made some fresh Star Wars Destiny decks now that the second wave Spirit of Rebellion has been released here in the United States. Not knowing for sure, I hope they have also released elsewhere in the world! 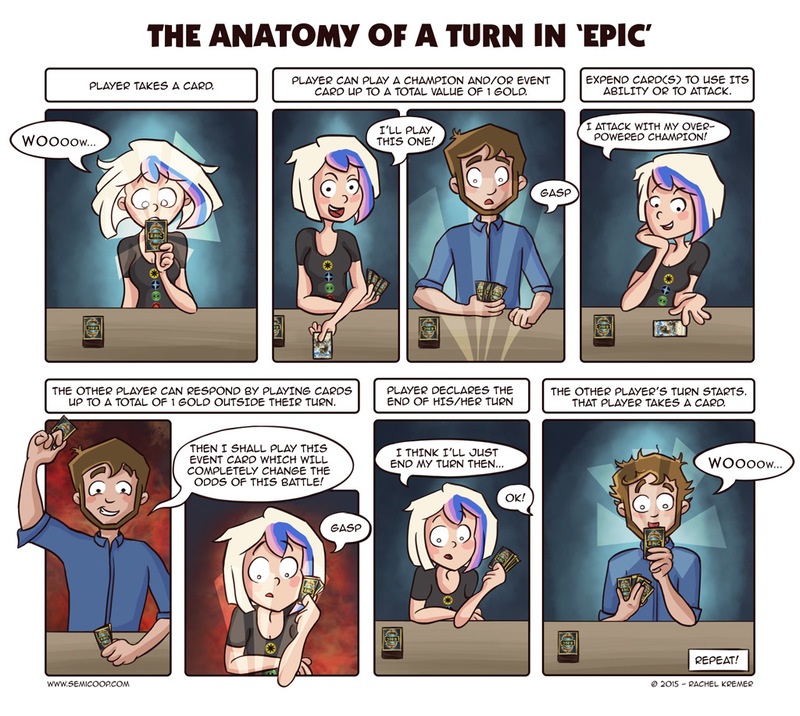 In addition to it being a great game I think you all would enjoy – based, at the very least, on your love of Netrunner – it would be a great source of ridiculous comic ideas like this week’s. Hi there. No need to wait for an app to play solo or coop. Someone has already made a hack/mod that let you automate the imperial player, and it works surprisingly well. I’ve tried it myself, and while the first mission or two will be a bit of a learning experience you’ll soon get the hang of it. To play this way you need to print out two decks of cards: One for telling the enemies what to focus on when they are activated, and another that tell what the objectives of each enemy is in each mission. I printed out mine on normal office paper and glued the backs onto them before I laminated and cut them out. Works perfectly fine. Hope she had +1 accuracy from some other source, or else she missed anyway *without* hidden. Hmm this is an interesting one. Page 6 of the learn to play guide has an example that uses the number of space empty between the two figures to calculate accuracy (“. The attacker rolled a total of 4 Accuracy. Diala is only two spaces away, so the attack does not miss”) . Page 9 of the rules reference guide seems to agree with you that it should be counted as the amount of movement points needed to move from A to B. So it seems we’ve always played using the example from the learn to play guide and missed the part in the reference that the space the target occupies should also be counted. It’s hard to read this at work… I was laughing so loud. You know, the more you try to control yourself, the more you laugh hahaha “can’t touch this”! Also I remember a big issue with my friends while playing Mansions of Madness. How could the freaking monsters simply by-pass a locked door from the INSIDE while we spent 3 turns trying (unsuccessfully) to open it from the outside, with some numbers and codes 😀 Good memories!